Khargo: Furniture and Design: Time to BBQ! Summer's here! 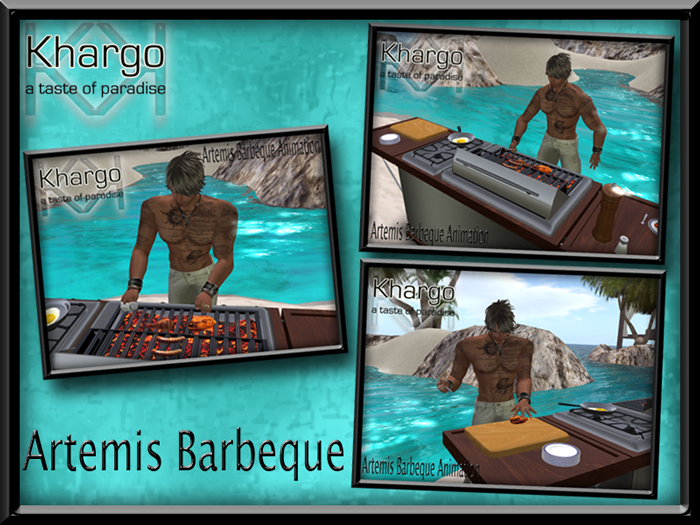 So let's celebrate with the Artemis Barbeque and Drink Dispenser. This set is made with a menu that lets you change textures (19 textures included in some of the items), tint, shininess, glow and brightness. This way this furniture can be changed to any style you want. The owner also has the option to make the menu available to everyone or only to himself. This menu is activated by clicking on the shadow prim of the item mostly. It also has the option to choose between different poses simply by clicking the chopping board and again you'll get a menu to change your poses this time. - 1 spot for single sit with 7 different animated poses. - texture, tint, brightness, shininess and glow changeable in 1 group. - lid opens and closes. 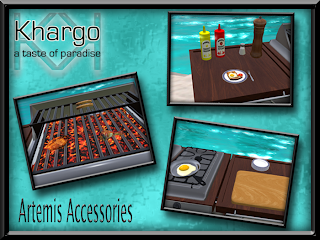 - 4 different wearable items to use with the bbq poses (knife, fork, salt and spatula). - 5 different pieces of meat or fish to put on the bbq. - drinks animate your AV when you wear them. All these items can also be bought individually in store or as a set on the SL Marketplace.